Firesetting. 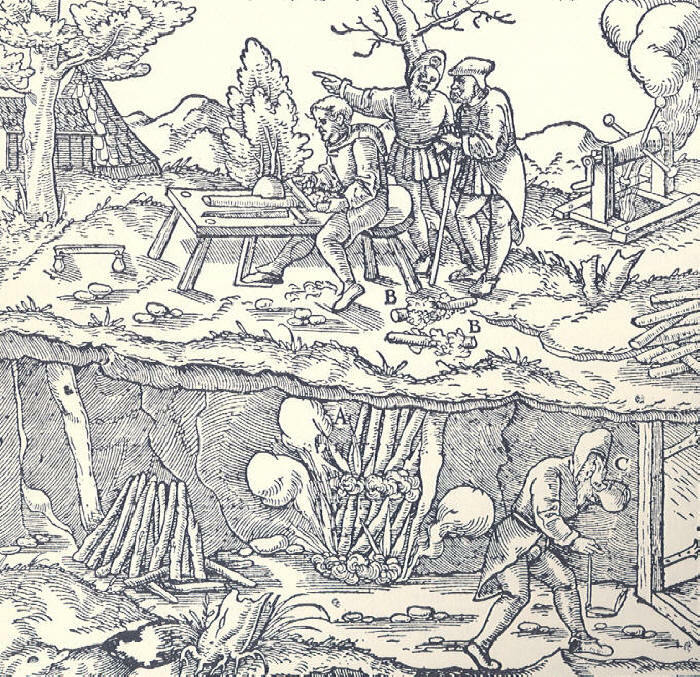 Illustrated by Agricola in the 1550s, this picture shows the technique of firesetting which has been used from prehistoric times to fairly recently as a way of softening rock. Fires are lit against the rock and the action of heat softens the rock. It is often said that the miners would then throw water over the rock to fracture it but given the risk from smoke and rock fragments, this seems unlikely. (Left.) Pillar Mine. 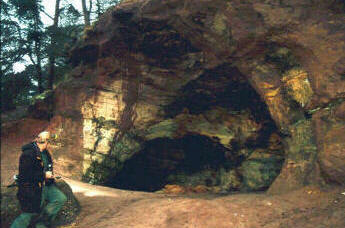 The entrance section of Pillar Mine is rounded and smooth, classic signs of firesetting. Alderley Edge was covered with scrub and small trees which would have provided good material for fires. There is no proof that firesetting was used here as the site has been heavily disturbed by visitors through the centuries. The blackening of the rock is recent and cannot be taken as an indication of firesetting.